How do you define the perfect lean process? Is there one? What does the perfect process look like? It's easy to look at an existing scenario and say, "Let's eliminate waste!" This Powerpoint is no longer available. But maybe you can make your own with a little effort? We organize work areas, we get rid of unnecessary items, we move things closer together, we create work cells, we level production, we cut back on work-in-process, we figure out what information's important and track it visually, we use simple pull systems, we develop complicated pull systems, we respect our people, we create a culture of continuous improvement, but what's the goal? Are we ever going to reach it? It's clear that no process is ever perfect and there's always room for improvement, but sometimes we can just get so caught up in the incremental improvements, the "kaizens", that we lose focus on the big picture. 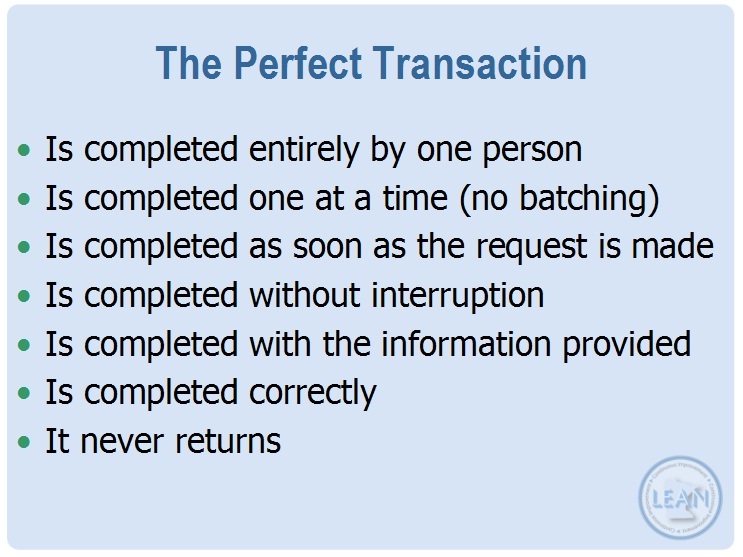 I came across this useful Powerpoint presentation that describes the perfect transaction. In a transactional environment like a bank or insurance company (or any large business for that matter), the processes that make and lose money for the business are transactions. So what does a perfect process look like? Completed by one person means no hand-offs to another person. This is counter intuitive to the manufacturing environment. When the cycle time of a process exceeds the takt time, we need to add a person. In a physical process, we would divide up the work like an assembly line, however, in a transactional world, the information hand-off can take longer than the work involved. In these cases it's better to work in parallel rather than in series. Although it may be easier to store up like bunches of material to do at all at once, this slows down the over all cycle time creates inventory. No waiting. This one's obvious! This one seems obvious too, but how many times are you interrupted while at your desk? You're going to be in the middle of something. The perfect transaction has no interruptions, since they lead to defects and waiting. If you have to ask for more information, than something's wrong. Accurate and complete data leads to less interruptions, less waiting, less defects. I hope so! Yet so hard to accomplish. Check out this article on how there are errors in 84% of San Francisco house foreclosures! Wonderfully stated. No errors, no rework. So have you experienced the perfect transaction? It's highly unlikely. Although with today's automated systems we're getting closer. And that's what kaizen is all about. We may not be able to get to the perfect process right now, but these small steps are meant to get us closer to the goal of a perfect transaction. This very useful transactional lean Powerpoint presentation is available from the same place as the Standard Pig exercise and a great paperwork simulation. Not only do we get the above description of the Perfect Transaction, you also get deeper discussion points about barriers to good information flow and specific tips to reduce inaccuracies. I'm not an expert on information flow, but it makes sense to me to use drop down menus instead of typing information into boxes. If you're working on lean in a place where information is the process, than you need to see this presentation. Simple, yet effective. You can no longer download this, since the link is broken.But still feel free to head on over to the Minnesota State Lean page to view all the available resources. I've added this to my list of helpful lean tools and downloads. Do you have anything to add to the Perfect Transaction? Feel free to comment below!